To reaffirm our commitment to this vibrant and historically significant multicultural neighborhood, AAI sponsors the Lower East Side Rotating Studio artist residency Program with artists chosen by a panel of outside artists, curators, and arts professionals. 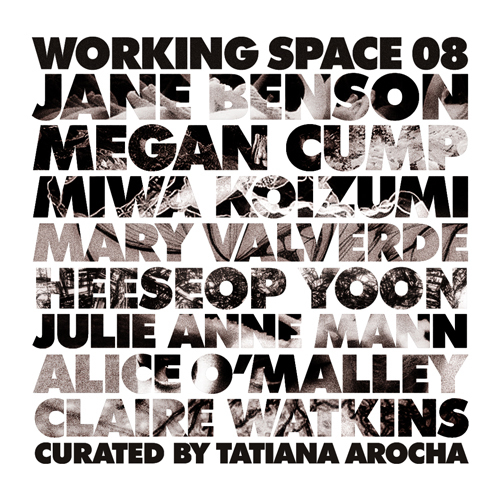 The artists selected are presented here in Working Space 08. Megan Cump is an artist who explores the metaphoric potential of the environment. Her work builds on photography’s historic dialogue with memory and mortality, presence and absence. Miwa Koizumi is an artist whose recent work reflects the idea of spirits in our everyday life. PETS is a series of sea like creatures made from garbage materials revealing themselves as part of our life. Julie Anne Mann work reflects the dichotomies found in life, hope and despair, life and death or the reality of our precarious ecological relationships. Alice O’Malley has collaborated over the past seven years with scores of downtown New York artists to create a photographic archive for the turn of the century. Mary Valverde is an artist most recently working with large scale site specific installations. Her interest is based in how patterns in the construction of physical spaces both strengthen and beautify. Claire Watkins is an installation artist whose curiosity of the minutia and delicate actions of everyday life form the foundation from which she creates new work. Electricity has a visual presence in Ms. Watkin’s work, and the machines that she builds reflect her awe and wonder of the energy around her. Heeseop Yoon is an installation artist whose work deals with memory and perception within cluttered spaces. Her drawings are based on photographs of actual spaces, obscured by her working without stopping or erasing.